BamaHoops: Bama Burns Boomers, Alabama 80 Oklahoma 73. Saturday was my girlfriend's 40th Birthday, and the Tide gave her the best gift of all, an upset W over the 12th ranked team in the country. The coaching staff deserves a lot of credit for coming up with a great gameplan. I expected us to play Young straight up, and concede that he would score 30-40 points, but try to slow the game down and force him to try to beat us by himself. Instead, we did the exact opposite. We threw several different looks at Young, including double-teams and fronting him to deny him the ball, and held him to his lowest total since his college debut. Collin, Herb, Dazon, Key, and even AJ were matched up with him at various points in the game. It was a great team effort and everyone contributed in some positive way. Petty made three 3s in the first half. Although he struggled with turnovers and didn't play great defensively the rest of the game, his early scoring opened up the offense and provided us with an early lead and some much needed confidence. With dozens of NBA scouts in attendance, Collin Sexton certainly helped his cause. He showed great leadership running point, played nice defense on Trae Young, showcased his strength around the basket and even posting up the OU guards. He finished with 18 points, but more importantly, I thought he played smart and within the system. He did not get out of control or try to do too much as we've seen at times this year. The NBA scouts may have been there to see Collin and Trae, but I imagine most also left with quite a few positive notes on Herb Jones. Herb continues to be our best all around player. He scored a career high 14 points, but more importantly played lock down defense on Trae Young. When Herb was fronting him it was impossible for Young to get the basketball. He also had 3 assists, 5 rebounds, 2 steals, and a couple of crowd inciting dunks. He ran the point at times while mostly playing in the 3 spot. Braxton Key had 11 points and 5 rebounds and is continuing to improve. He made a couple of huge 3s in the second half after Oklahoma had battled back to the take the lead. Key has been making some big plays at key moments for us lately, and it's great to see him getting back on track. I think some of the criticism of him has been unfair. Donta was a force inside. He ended up with 8 blocks, 9 points, and 7 rebounds. His presence in protecting the rim was huge for our defense. Dan also had 9 rebounds in 17 minutes. Dazon contributed with 8 points, but also played nice defense and made the free throws when we needed them most toward the end of the game. We were only 12 of 22 from the line, but we seem to make the ones that count the most. I thought the playing rotation was much better. Galin Smith did not play, and AJ only played 8 minutes while Collin got 32. Lon Kruger is a good coach, but I don't understand his thought process in the final couple of minutes. He seemed to throw in the towel when he was down 8 with still nearly a minute and a half remaining. I was surprised they took Young out, and did not foul and attempt to extend the game. This was a huge win for the program. Obviously it's a nice resume builder, but it also helped secure a win for the SEC in the Big 12/SEC Challenge. More importantly, it was in front of a truly packed house. 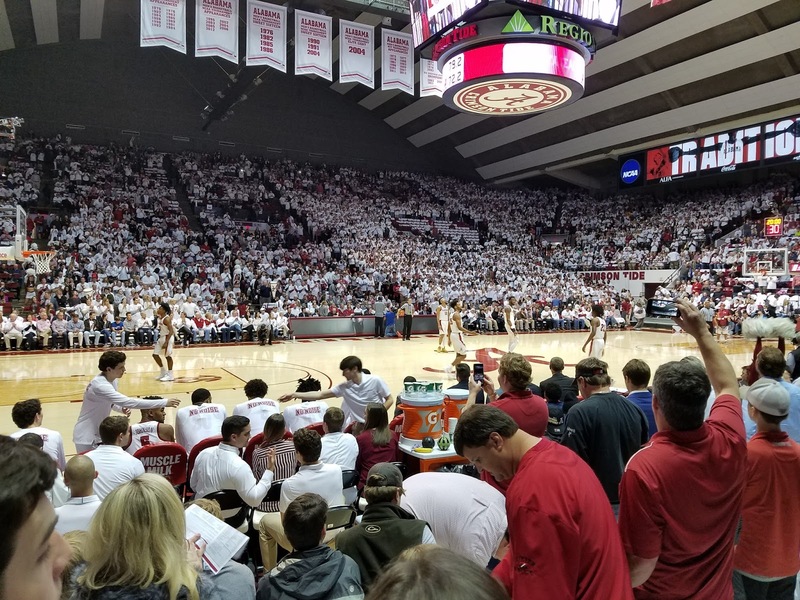 We've missed some opportunities for big home wins in recent years, but hopefully with victories now over auburn and Oklahoma, we are beginning to establish a true home court advantage. The crowd was fantastic. I'm not a big fan of the "white outs." In fact, I refused to participate and stuck with my gray Bama basketball tshirt. Every time I have participated in the white-out, we've lost. Anyway, the fans were loud and enthusiastic the whole game. There were very few OU fans in attendance and they were relegated to the top corner. 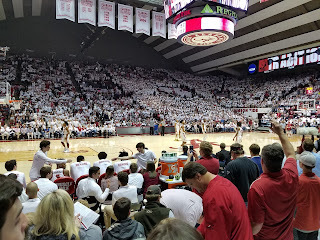 It was the best atmosphere I've seen in the building in many years. My only complaint was the constant "o-ver-ra-ted" chants at Trae Young and OU, particularly early in the game. Those could have really came back to haunt us. Furthermore, Young is certainly NOT overrated. He just scored 17 on a "bad day." Saying OU is overrated diminishes what our guys accomplished, in my opinion. Up next, it's back to the SEC grind as the Mizzou Tigers come in for a late 8pm tipoff Wednesday night. The margin for error is still razor thin, so we can't afford a let out. Hopefully another sell out crowd will help keep the guys fired up. The game will be televised on ESPN2.